This morning my 14-year-old daughter and I decided to take a yoga class together. We ventured from our cozy home in Madison Valley all the way to West Seattle for Terilyn Wyre’s “Yoga Church” at 9am. This was a class I’d be meaning to attend for at least a year; I knew Terilyn held a space of great love and community. What I’d forgotten so early in the morning was that this day, a Sunday in December, was also Winter Solstice. Terilyn dove right in at the start of class and helped all of us connect to this powerful transition from fall to winter, and from winnowing sun to longer days and shorter nights. She spoke of the dark giving birth to the light, and this time as our opportunity to birth our coming year. We practiced moon salutes for the feminine and sun salutes for the masculine, we placed hands on our neighbor’s backs, and we sat squeezed in tight for a 45 person chair pose, one on top of the other. I lost myself a bit in that class, lost a bit of my self-consciousness, my Seattle reserve, my seriousness, and as I sat on my daughter’s lap I laughed and laughed, a huge smile as I looked at all the amazing smiling faces in that chair-circle. What I gained was a reminder of the power of community. It’s a power beyond words. 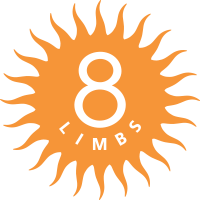 And that’s my prayer for this winter – to keep dipping into the amazing 8 Limbs community that brings such light to the darker days. You all are truly amazing! We’ll come together again in February for the 28-Day Commitment, we’ll see each other in the studios and on the streets, and we’ll remember that spirit when we practice on our own mats, at home, strengthening the thread of yoga that can support every other thing we do. Happy Solstice all of you. May you “birth” an amazing year of strength, courage, love, and grace. P.S. Join me the day after Christmas at 8 Limbs Wedgwood for the 9:30am class!